A table representing the production numbers of orchard fruits and nuts in Seminole County, Florida during 1924. Statistics in the table identify various products produced in the county, the number of trees for all ages, the number of trees of non-bearing age, the number of trees of bearing age, and vines of all ages. The U.S. Census of Agriculture identified peaches, plums and prunes, grapes, lemons, grapefruit, oranges, and pecans as orchard fruits and nuts. Cepero, Laura. 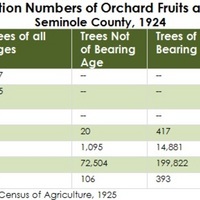 “Production Numbers of Orchard Fruits and Nuts, Seminole County, 1924.” RICHES of Central Florida accessed April 18, 2019, https://richesmi.cah.ucf.edu/omeka/items/show/3110.